By 1993, hip-hop was transitioning from an organic form of musical expression into a big business fabricating stars. 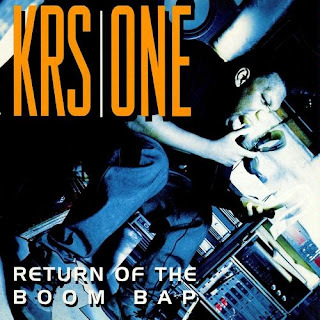 With many icons from his era either aging or losing their relevance (e.g., Chuck D, Rakim), KRS-ONE dropped a gem of an album that not only navigated the sound of the day but led the charge. Shedding his previous Boogie Down Productions moniker, KRS-One's Return of the Boom Bap is not just an album: it's KRS's call to arms for the return of hard beats and real rap in hip-hop music. The former took many forms, thanks to the recruitment of Gang Starr's DJ Premier, who was hitting his stride as hip-hop's preeminent beat-maker. Primo crafted the classic head-nod rhythm of the title track, the bump of "Outta Here," an autobiographical tale of KRS-One's rise in hip-hop, and the dancehall-inspired riddims of "Black Cop" and "Sound of da Police." Lyrically, KRS-One displayed variety in both style and content, meshing old-school bombast ("Mortal Thought"), consciousness ("Higher Level"), and crafty and conceptual wordplay ("I Can't Wake Up"). The album opens with KRS-One boasting, even decreeing, that he would "be here forever." At the crossroads, this album made it seem true.